If you’ve been reading here, you would know this. Again, no surprise to anyone who reads here regularly, I think he is on target. I must admit, this is satisfying. When I first dropped my article in 2005 questioning reparative therapy, I was beaten up pretty badly by those in what was the ex-gay movement at the time. Things have changed. Focus on the Family is out of the reparative business for the most part. Exodus is now working on congruence as a goal, and NARTH is fighting for its life. And the APA has taken a position that congruence as an objective is acceptable. Did they gain 1,000 members in less than a year? In October, 2011, I asked David Pruden at NARTH how many professional members were on the rolls. He told me the number was at 250, with the remaining 750 or so being advocates and laypeople. Is this puffery or have they gained 1,000 names since last October? UPDATE: David Pruden just wrote to say that he did not tell the reporter 2k so perhaps it was a misunderstanding. Did we parrot our professors to write Getting Jefferson Right? The book we recently did on the Jefferson Lies, there’s two professors who came out with a book rebutting it before I’d even released the book! We don’t have to read this stuff, we know it all false. I know of no other book by two professors which rebuts The Jefferson Lies, so I am pretty sure he is referring to our book. As RightWingWatch blogger Kyle Mantyla points out in his write up of Barton’s show, we announced the May 1st release of our book on May 3rd. Barton’s book was officially released on April 10, 2012. …what’s happened is all these secular guys have been training students that were Christians, but now these Christian kids have been trained with a secular philosophy, they’ve become our professors and they’re just parroting what they heard. It’s not that they went back and check for themselves, they just assumed that their professors were right- they really like their professors, they were nice guys and they were really educated and had three Ph.Ds and they told me all the Founders were atheists. And so now you’ve to Christians repeating exactly what they’ve been taught rather than what truth and what history actually is. In my case, I took undergraduate history from professors at Cedarville University, a pretty conservative Baptist school. None of my professors there told me that the founders were atheists. 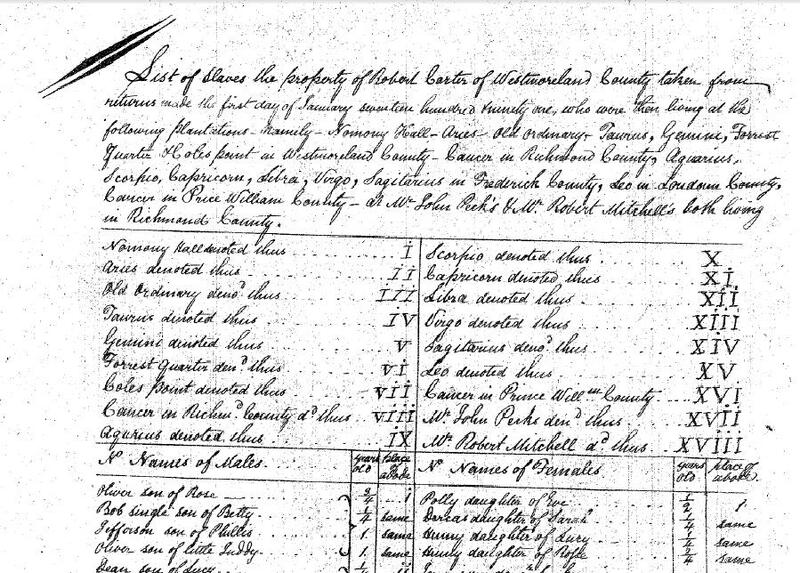 Beyond that, I don’t remember much of what they taught, except that the founders were a pretty diverse bunch. In my psychology and counseling graduate training, I don’t think I ever heard anything about the founders. Mike Coulter is a graduate of Grove City College with his graduate work from the University of Dallas, a pretty conservative Catholic school. We both teach at GCC which is pretty well established as a conservative school, not known for parroting a liberal position. Mr. Barton, that dog won’t hunt. Author Warren ThrockmortonPosted on June 26, 2012 Categories david barton, history, politicsTags david Barton, getting jefferson right, the jefferson lies26 Comments on Did we parrot our professors to write Getting Jefferson Right? Co-author of Getting Jefferson Right: Fact Checking Claims about Our Third President, Michael Coulter, was interviewed for this Current.org article which goes in depth about the firing of Alabama public TV executives. One fired executive suggested that the firings related to refusal to air David Barton’s DVD series about the founding era. The current APTV board says the firings were unrelated to disagreements over programming. After reading the article, I think there is room for skepticism about that denial. Pizzato and his staff had “grave concerns” that the Barton content was inappropriate for public broadcasting due to its religious nature, Howland said. Pizzato also sought advice from the station’s attorney in Washington, D.C. Todd Gray of Dow Lohnes confirmed he spoke with Pizzato about the Barton programs but he declined further comment. In a brief interview with Current, Pizzato declined to discuss the programs or describe how he responded to the commission’s request that APT broadcast the Barton videos. But minutes of the June 12 meeting, which have not yet been formally approved by the commission, reveal that he proposed a different set of programs for broadcast. Pizzato unveiled a new show, In the Public Interest, which would “tackle issues that have been of some concern to the Commission.” Pizzato also offered to run a 1992 documentary on creationism, Voices for Creation. Creationism also was a potential topic on In the Public Interest,Pizzato told commissioners. Soon after, the minutes say, commissioners went into executive session to discuss Pizzato’s “general reputation, character and job performance.” About an hour later they returned to announce that they had voted to oust Pizzato and Howland. According to the article, Pizzato appears to be preparing a suit against the Alabama PTV board. Discovery will be intriguing if it gets that far. Brent Bozell runs Media Research Center and founded ForAmerica but is promoting a quote falsely attributed to Thomas Jefferson. See the picture below exploding all over Facebook. Comments: This exact quotation has not been found in any of the writings of Thomas Jefferson. It bears some slight resemblance to a statement he made in a letter to John Norvell of June 14, 1807: “History, in general, only informs us what bad government is.” However, the quotation as it appears above can definitely be attributed to John Sharp Williams in a speech about Jefferson, which has most likely been mistaken at some point for a direct quotation of Jefferson. Click the link to get the sources for this note on the fake quote. Over at the Facebook page where this image is listed, over 85,000 people like the false attribution and over 2700 people have commented on it. Some, including me, have posted the Monticello link. The picture and the quote remains. ForAmerica’s mission is to reinvigorate the American people with the principles of American exceptionalism: personal freedom, personal responsibility, a commitment to Judeo-Christian values, and a strong national defense. We believe in limited government with Constitutionally-enumerated powers only. We believe that the size of the federal government should be dramatically reduced and that government’s regulatory stranglehold on the free enterprise system should be lifted. We believe in freedom. I suppose that one of those Judeo-Christian values is honesty. I hope this means that the reinvigoration of the people can happen with honesty. 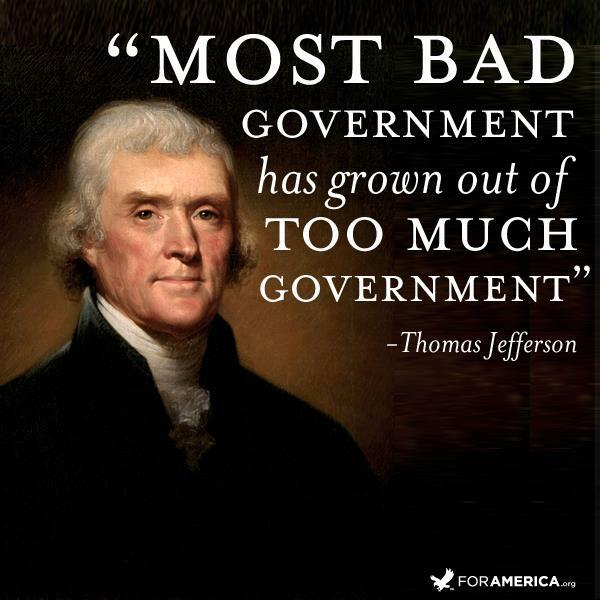 As far as I can tell, Jefferson was pragmatic about the role of government. He saw a limited role for government in reinvigorating citizens with religious values but did want the government of Virginia to generously fund the University of Virginia, and public education in general. Here is the earliest use of the quote found by the Monticello researchers and it was not by Jefferson but by Mississippi Senator John Sharp Williams who delivered lectures about Jefferson at Columbia University, published in 1913. Williams was a democrat and supported Woodrow Wilson’s call for an income tax. Last year when an atheist group got caught in a spurious quote snafu, they acknowledged their error. Will ForAmerica? 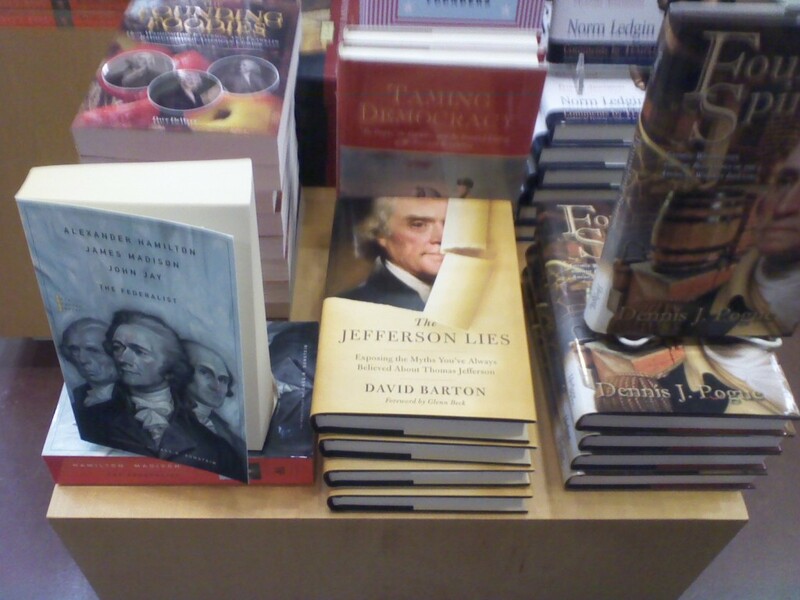 The Jefferson Lies was on a prominent display along side other legitimate books of scholarship in the Williamsburg Visitor’s Center bookstore. When I talked to the manager about the book, he was sympathetic but said there was nothing he could do, saying such books are included as a business decision. Idealist that I am, I was disappointed to see it there. Gentle readers, weigh in. Should I be surprised? Am I expecting too much of a place which strives for historical integrity to have those values spill over into decisions about which books to carry in the book store? I was at Monticello yesterday also and the bookstore there did not carry the book; why should Williamsburg?